The actions of January 22, 1973 dramatically changed the course of our nation as the U.S. Supreme Court ruled on Roe v. Wade. In spite of its impact, the true understanding of Roe and what it brought about remains relatively vague in the public consciousness. It is imperative that we, as citizens, understand the facts about what Roe does and does not do. 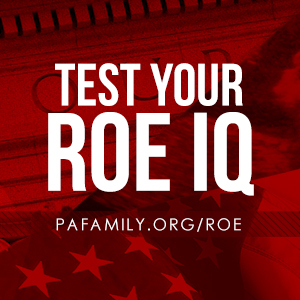 We challenge you to take the Roe IQ Test to measure the current awareness of Roe and its effects, as well as to provide detailed information about the ruling. It only takes a few minutes to complete the test. Your answers and results will remain 100% confidential. We hope you will take the IQ Test and invite your friends to do the same. If you think you know Roe, we think you’ll be surprised! Do you know Roe? Click here to find out.